Boats slide by in dark waters as Michael Caine’s English drawl recounts the seductions of Saigon in 1952 in the introduction to the haunting and surprising film The Quiet American (adapted from a Graham Greene novel). And so we meet Thomas Fowler (Caine), an aging journalist for the London Times who has discovered a paradise away from London — and away from his Catholic wife. He’s filed only three stories in the past year from his post, spending his time at home with his lovely Vietnamese mistress, taking tea at the hotel, and smoking opium. Fowler knows more than he tells the detective about his role in the young man’s life and death, and tells his story from when he first met the now-quiet American. Despite its title, The Quiet American is less about Pyle than about Fowler; it is the story of a man who has sold his soul – or perhaps lost it somewhere along the way. The intrigue begins innocently. Pyle appears to be an idealistic do-gooder abroad. He and Fowler become friendly despite their differences. Fowler describes the detachment he has attained saying, “Even an opinion is a form of action.” Pyle’s ambitions, in contrast, motivate him to get involved, to aid the poor and diseased — even to take sides in the current French-Indochinese conflict: Pyle carries a book that advertises his conviction that a third force — not the Americans as many advocate — is needed to end the conflict. 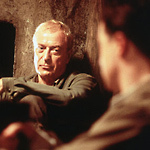 Caine’s face shows both Fowler’s fascination with and condescension toward his new acquaintance. When Fowler introduces Pyle and some of his friends to his mistress Phuong (Do Thi Hai Yen), Fowler’s life takes a turn for the worse. Pyle looks even more gracious in contrast with his drunk friend who wants to buy his pleasures and fails to see Vietnamese women as people. Quickly Fowler winnows Pyle away from his companion and Pyle apologizes profusely for his friend’s behavior. Pyle dances with the lovely Phuong several times and quickly displays his own preconceptions. He decides Phuong represents a fate narrowly escaped and an opportunity for rescue. Fowler tries but cannot correct some of Pyle’s naivete about Vietnamese society: for example that in Saigon, being a taxi dancer, with whom nightclub patrons pay for dances, is not so close to being a prostitute. Fowler’s employers want him back in London, so he tries to buy himself more time by telling his editors he’s at work on a big story. He decides to travel upriver to Phat Diem, where a meeting with the North Vietnamese communists is rumored to be taking place. He runs into Pyle, who is apparently ministering to the villagers. They witness the results of a shocking massacre that Fowler immediately recognizes as something other than the work of the Communists or the French soldiers. Fowler starts asking who was behind the massacre. Pyle gives him access to General Thé (“Since when is he a general?” Fowler asks, to which his Vietnamese assistant replies, “Since he made himself one.”). Thé is amassing his own forces in a bid to be that third party that some believe is needed to take charge of Viet Nam’s future. Fowler’s pointed questions about the financing of his growing army anger Thé, who walks out of the interview. When Fowler later presses Pyle about what he is doing there, Pyle confesses that he wanted to see Fowler. The American announces that he has fallen in love with Phuong and intends to marry her. After all, Fowler has a Catholic wife who will never grant a divorce and Phuong’s shrewd, manipulating sister also has decided that the respectable, young, and smitten Pyle is her beautiful sister’s best chance at a respectable future. Fowler is stunned; he loves Phuong. “Losing her would be the beginning of death,” he says, forced to depart from his cultivated detachment. He does not see his lover as the concubine Pyle presumes her to be. Fowler decides to take the high road and allow her to choose between the two men, aware that the young doctor has more to offer but hoping she will pick love over economics. He also knows he can only give Phuong a roof over her head if he stays in Viet Nam, which is looking less likely as his Times editors try to summon him back to England. As Fowler digs deeper, he finds Pyle always behind the scenes, whether he is receiving shipments that are bypassing customs or meeting with Phuong and her sister to discuss Phuong’s future behind Fowler’s back. Brendan Fraser is nicely cast as the eager young man who appears to have no mystery, only good manners and a blunt enthusiasm for his causes. Fowler’s suspicions about Pyle only increase as he and his assistant, who also turns out to be more than he appears, do a little sleuthing and discover shipments of a milk-based substance with the name of Pyle’s aid organization stenciled on the crates. Pyle insists the compound is used in the manufacturing of eyeglass frames; Fowler’s research reveals it is a component of plastic explosives. When a car bomb rips innocent people apart in the Saigon plaza where Fowler takes his “elevenses” at the hotel every day, Fowler is deeply shocked, especially at the sight of Pyle directing people in Vietnamese. Fowler doesn’t even speak Vietnamese, but Pyle speaks it “like he was born to it.” Fowler becomes certain that Pyle’s role in recent events is more sinister than he ever guessed. Director Phillip Noyce (Rabbit Proof Fence, Patriot Games) delicately reveals the identities and internal conflicts of the principal characters. Fowler is a reporter-gone-soft in his twilight of his life, yet we discover his willingness to risk everything for a chance to keep his love and adopted home. Fowler’s relationship with Phuong seems to be a metaphor for his relationship with Viet Nam: As much as he loves her, he will never truly understand her or be able to give her what she needs. Fowler suspects the same is true of the young and idealistic Pyle: he thinks she needs saving and that a big strong well-meaning American is just the man to do it. Phuong remains the most enigmatic character, her face revealing only glimpses of her feelings. She loves Fowler but appears resigned to her sister’s conviction that she must leave Fowler and pursue marriage to the eligible Pyle. The texture of life in 1950s French colonial Viet Nam in the midst of the French-Indonesian War seems like another character in this story. The cinematography, credited to Christopher Doyle, Huu Tuan Nguyen, and Dat Quang, evokes the sensations of cool tile floors in high-ceilinged French colonial Saigon, the decay at the water’s edge, and the flowing silks the women wear. This is a timely film, controversial among some for its anti-American attitudes. The big, mannered, and confident character of Pyle embodies (and presages — Greene published his novel in 1955) Americans’ willingness to use its might to affect Viet Nam’s destiny in the years before the Vietnam War. The Quiet American peels back layers of character and circumstance to reveal people’s mysteries in the midst of political turbulence. Without drawing conclusions, the film explores many moral and ethical dimensions of people’s need for the Other, the exotic, the foreign, sometimes to suit a larger purpose and sometimes to suit their own desires.